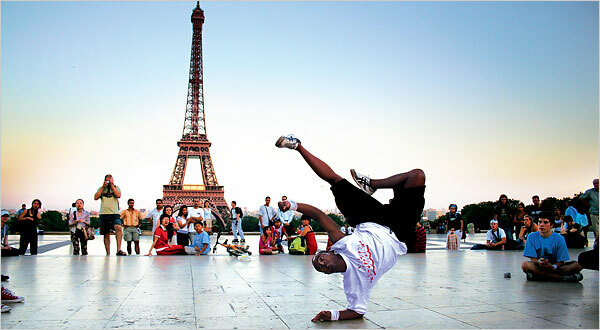 It’s official: the documentary “Planet B-Boy” knocked my socks off. Spinning on their heads, back flipping like it ain’t no thing, toiling day after day on their moves: teams of breakdancers prepare to battle for the title of best in the known universe. The documentary profiles teams from around the world, showcasing their individual struggles and strengths. There’s the French team with all their camaraderie and warmth, whose interracial, cross-generational crew included the super-idiosyncratic dancer Crazy Monkey as well as a little blond kid. I was also touched by the diligence and dedication of the Korean teams, both the returning international champions and the underdog challengers, “Last for One,” a crew of impoverished kids from the South Korean boondocks who danced daily from midnight to dawn to polish their routine. Aside from the unbelievable athleticism, each team combines two key elements: incredible teamwork and extreme individuality. It’s one of the great paradoxes of art: through the process of diligently internalizing the fundamental skills of an art form, artists become more free, not less. Through discipline, they become more radiant versions of themselves. This documentary also addresses some questions about authenticity that are really close to my heart as someone who has spent lots of time in other musical cultures. What makes each of these dancers a b-boy is not their skin color or where they were born but their mastery of the art form. Their skills and experience make them completely secure in their identities as artists. For their awesome example of self-determination, motivation, and extreme customization, I hereby nominate the dancers of planet B-Boy for the title of self-made heroes!